What is it with the ladies in LA and their denim on Sundays??? Love it. I stumbled upon musician Cindian outside of my friends’ place this morning. (Killer Yard Sale on Stanley & Oakwood if you’re in the area.) 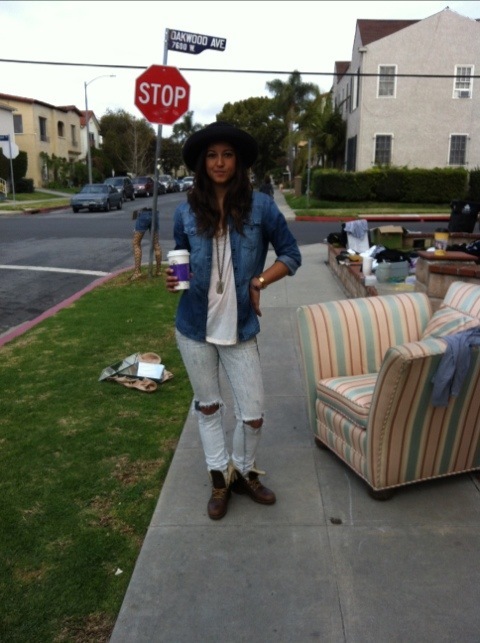 The San Diego native is seen here in acid washed Volcom jeans and an H&M denim shirt. Check her music out on Soundcloud. Good stuff, especially now that the sun came out in Los Angeles. This entry was posted on Sunday, January 22nd, 2012 at 12:37 pm	and tagged with Canadian Tuxedo, Cindian, Denim, Denim on Denim, double denim, Fashion, H&M, Jeans, Los Angeles, Music, Soundcloud, Volcom and posted in In The Wild, Music. You can follow any responses to this entry through the RSS 2.0 feed.